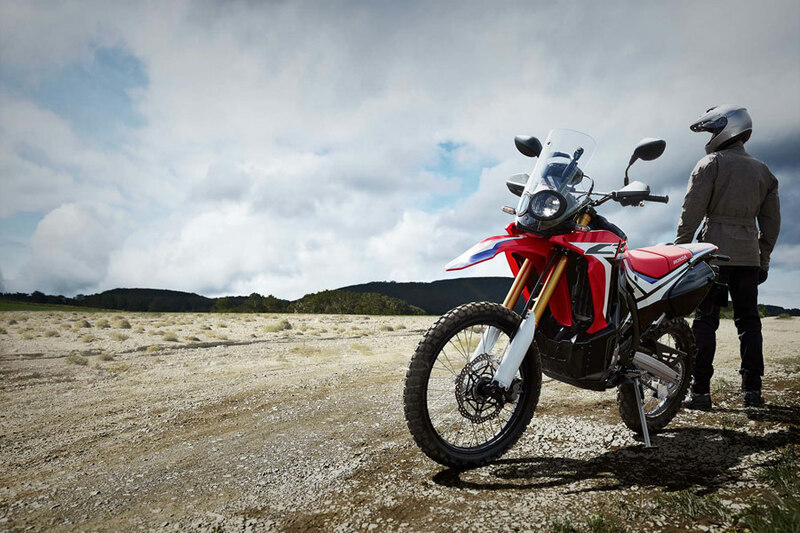 The CRF250L RALLY is ready for weekend adventure, long distance tour or the daily commute, with long travel suspension, large-disk brakes, excellent weather protection from the CRF450 RALLY-inspired bodywork and an impressive cruising range. Engine performance combines solid bottom-end torque with substantial top-end power. A 250cc dual purpose motorcycle covers many bases: it slips easily through congested traffic as is equally comfortable on rougher roads and trails all thanks to lightweight and slim proportions matched with superb maneuverability as well as the great suspension, ground clearance and seat height. The 250cc dual sport package delivers a fun and comfortable ride in almost any situation. 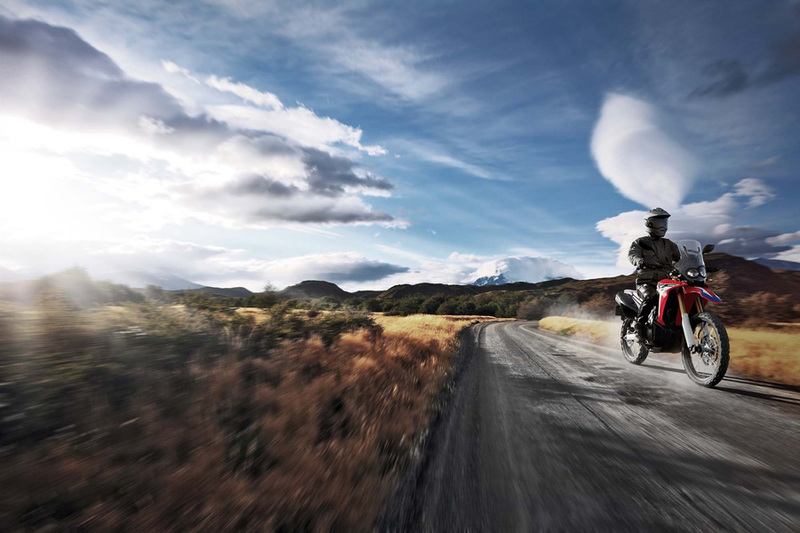 A whole new range of two-wheeled opportunities to both experienced and new riders. With styling DNA drawn directly from the HRC CRF450 RALLY Dakar racer, the CRF250L RALLY brings something new to the market. It not only looks ready to compete in a desert stage, but also delivers a real taste of adventure to riders who prefer a light, easy-to-manage machine. Around the world or around the block, the CRF250L RALLY is good to go. 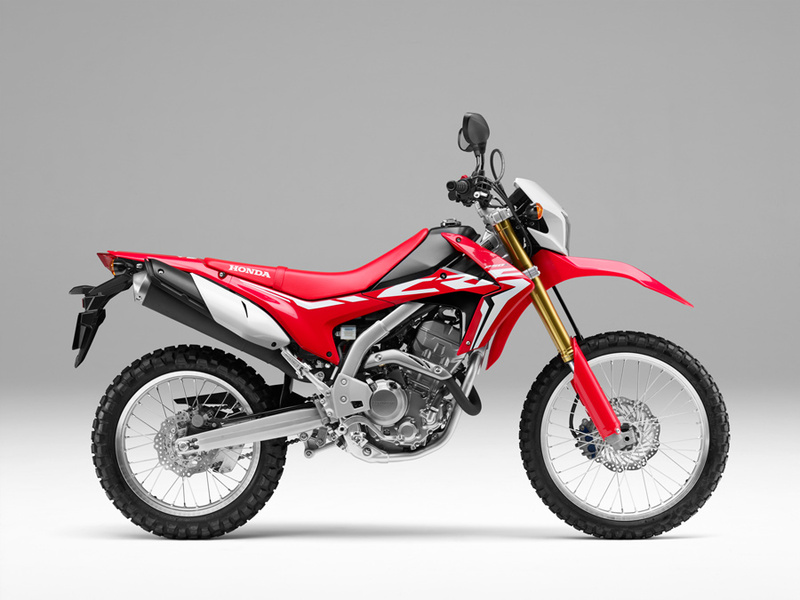 The CRF250L RALLY uses the CRF250L as its base, and adds a wide range of changes that make it a unique proposition in the market. Styling inspiration draws fully on the HRC CRF450 RALLY race machine. At the front, the ‘floating’ screen, fairing and radiator shrouds provide wind protection, with the rest of the machine showing off minimal MX style. The asymmetric headlights are LED, as are the indicator lights. A large fuel tank allows extensive range, and the new digital dash includes a fuel gauge and tachometer. 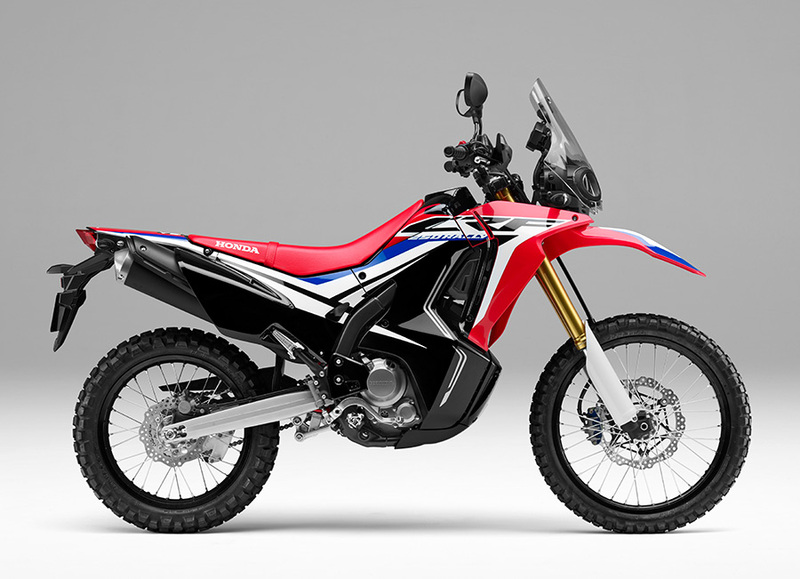 Long travel suspension and high ground clearance enhance its long-distance off-road ability and a larger floating front disc –The engine boasts solid bottom-end torque coupled with substantial top end power thanks to changes compared to the original CRF250L, which include revised PGM-FI and throttle body, a new airbox, connector tube and lightweight exhaust. The CRF250L RALLY is designed to cover distance and its styling reflects this. Derived from the parts used by the CRF450 RALLY, the ‘floating’ screen, upper/lower fairing and side shrouds effectively shield the rider to offer excellent defense against the elements. Hand guards offer further protection, both for the hands and the brake and clutch levers. From the machine’s mid-section back, the style is MX-sharp, with side panels and a seat/tank interface that help the rider move freely. A skid plate protects the machine’s underside and the gear lever features a folding tip. Seat height is 895mm, 20mm taller than the CRF250L. The headlight is a compact, asymmetric dual LED unit while the rear light, LED indicators and number plate bracket tuck discreetly away. Cohesively laid-out, the digital dash features a speedometer, tachometer plus fuel gauge and clock. The 2.6 fuel tank delivers an approximate range of over 200 miles. The flat filler cap is hinged for rider convenience. The CRF250L RALLY comes finished in Honda’s Extreme Red racing colour as a base, with black and white accents inspired by the HRC factory machines. The CRF250L RALLY’s frame is constructed from steel, with twin oval-section main spars and a semi-double cradle. A wheelbase of 1,455mm is matched to a 28.1° rake with 114mm trail and ground clearance of 270mm (15mm more than the CRF250L). Wet weight is 157kg. A new 43mm Showa inverted fork shares the same 250mm stroke as its sibling, but with 50mm extra overall length. Light weight and rigid, one side houses the spring while the other provides damping control. 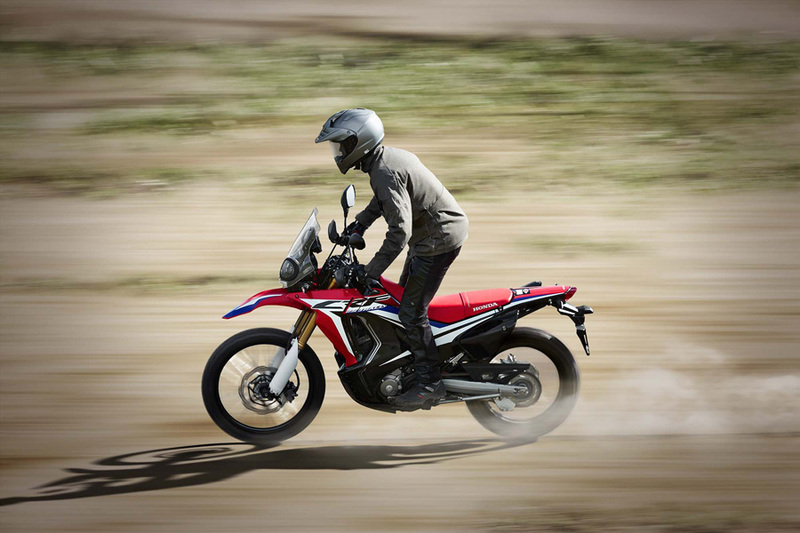 Both spring rate and damping have been optimized to suit the CRF250L RALLY’s adventurous long-distance aspirations. A 17mm front wheel spindle (2mm larger in diameter) improves strength and handling feel. Pro-Link rear suspension features a 265mm axle stroke, 25mm more than the CRF250L plus a leverage ratio revised for ride comfort. The Showa shock absorber is a single tube design with 40mm diameter cylinder. The tapered aluminum swingarm incorporates a monoblock casting that provides the correct rigidity balance and reduces un-sprung mass. Extruded aluminum is used for the chain adjustment collar. For extra braking power a 296mm floating wave-style disc is worked by a two-piston caliper. Stylish black Alumite aluminum rims (21-inch front/18 rear) mark the CRF250L RALLY out and wear block pattern enduro-style tires. The CRF250L RALLY’s 250cc liquid-cooled single-cylinder DOHC engine’s performance is focused on bottom-end torque and high rpm power, plus a linear delivery. Peak power of 24.4hp is delivered @ 8,500rpm. The PGM-FI feeds the fuel/air mixture through a 38mm throttle body and draws air from the airbox via a direct connecting tube. The exhaust muffler has a diameter of 115mm, houses the catalyzer and uses two chambers. A large-bore downpipe helps the engine breathe and make more power. The engine uses a compact roller/rocker arm valve train and cylinder head, with bore and stroke of 76x55mm. An offset cylinder reduces frictional losses while the piston itself incorporates a special surface material, plus a molybdenum coating. The oil pump features an internal relief structure that prevents aeration of relieved oil. The crank journal employs a half-split, press-fit metal bearing while the crank bearing uses a cast-iron bush, reducing weight, smoothing the engine and strengthening the rigidity of the case housing, minimizing the internal diameter change due to thermal expansion. A primary balance shaft further reduces vibration and the six-speed gearbox and clutch are manufactured to cope with the extra stress of riding off-road. The 10.7 kW heat-release radiator features a thin guide-ring cooling fan to maintain even temperatures at low speeds. Compact and sophisticated liquid-cooled DOHC 249cc single-cylinder four-stroke powerplant produces smooth and consistent torque at low rpm, plus excellent high-rpm performance. A 38mm throttle body (up 2mm from the 2016 CRF250L) combines with a revised airbox, reshaped air boot, new muffler design and a larger-diameter exhaust head pipe to provide improved response and better power in the low and midranges. Extremely compact roller rocker arm design for the low-friction valve train allows the use of a smaller cylinder head. Gear-driven counterbalancer shaft helps reduce vibrations for rider comfort. Electric start for easy starting. Heavy-duty clutch offers smooth, progressive engagement. Heavy-duty O-ring–sealed chain for durability and reduced maintenance. Rally-type “floating” screen, fairing and radiator shrouds provide wind protection, with the rest of the machine showing off minimal MX style. LED asymmetric headlights, as are the turn signals. Large fuel tank allows extensive range. Chassis developed specifically for the CRF250L provides excellent handling and agility. Lightweight semi-double-cradle high-tensile steel frame. Strong 43mm inverted fork provides 11 inches of travel. Pro-Link single-shock rear suspension delivers 10.3 inches of rear-wheel travel. Powerful wave-design 256mm front disc brake, and 220mm rear disc brake provide strong and consistent stopping power. Meter assembly, taillight and license-plate holder have all been updated for 2017. Large floating front disc—plus ABS that can be switched off for the rear brake—delivers stopping power. Front 21-inch wheel and 18-inch rear wheel with lightweight aluminum rims. New digital dash includes a fuel gauge and tachometer. Durable front and rear steel sprockets. High-quality handlebar with comfortable grips. With a light, slim package that’s able to easily maneuver through congested city streets, along with a confidence-inspiring seat height and suspension that deliver a fun and comfortable ride on rough tarmac and trails, the adaptable CRF250L is already an extremely popular dual-sport model, and it benefits from a number of upgrades for 2017. Visually, it’s strikingly different thanks to new graphics that match those of the revolutionary 2017 CRF450R motocross machine. Technically, a 38mm throttle body (2mm up from 2016) combines with a revised airbox, reshaped air boot, new muffler design and a larger-diameter exhaust head pipe to provide improved response and better power in the low and midranges. There’s a new ECU as well, and the meter assembly, taillight and license-plate holder have all been updated as well. For 2017, a 38mm throttle body (up 2mm from 2016) combines with a revised airbox, reshaped air boot, new muffler design and a larger-diameter exhaust head pipe to provide improved response and better power in the low and midranges. Strong 43mm inverted fork provides 9.8 inches of travel. Pro-Link single-shock rear suspension delivers 9.5 inches of rear-wheel travel. Strong, lightweight rims with straight-pull spokes. Motocross-style seat is low and comfortable and allows maximum rider movement.